Universal Declaration of Human Rights Article 17. Everyone has the right to own property alone as well as in association with others. In the heat of al-Waleed camp, where in the summer midday everything reaches burning temperatures, tents catch fire. This photo shows a group of men trying to salvage what is salvageable from their “property” after yet another one of nature’s shows of animosity toward the displaced everywhere, and of course toward the displaced of Al-Waleed. What would your thoughts be if you were there searching through empty Coca-Cola cans and half-charred pillows? Wouldn’t you trade your right to own “property” and all you own — or owned before the fire — for your right to happiness, laughter, song and dance, playgrounds and parks and schools and hospitals and security and …a stomach full of good food? 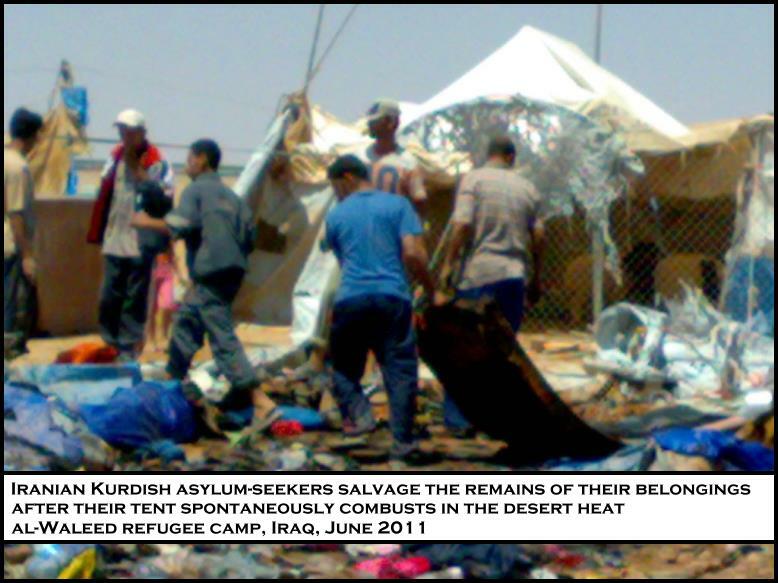 Read more about the situation of Iranian Kurdish refugees at al-Waleed camp, Iraq. Write, call and fax key decisionmakers and demand that the rights of the Iranian Kurds in al-Waleed Camp be upheld. A sample letter that you can modify and send appears below, along with the email addresses for the relevant decisionmakers. I am writing to you with regard to the intolerable situation of the Iranian Kurd refugees in al-Waleed Camp, Iraq. Their current situation – living in tents in a burning desert at the Iraq-Syria border, without access to education or work or even sufficient food, with complete lack of security – is at root due to the genocidal crimes of the Islamic Republic of Iran. UNHCR also bears its full share of responsibility for failing to uphold even the most basic of rights for the camp’s Iranian Kurd residents. And the United States and the coalition governments also must own their share of responsibility for their situation: theirs are among the millions of lives that have been shattered as a direct result of the most recent war of choice in Iraq. I therefore urgently request that your government take the lead in upholding the fundamental rights of these refugees from Iran. These refugees have a fundamental human right to asylum and protection. I ask your government to coordinate the immediate resettlement of the Iranian Kurds from al-Waleed Camp in Iraq to a safe third country.